Lara has been practising yoga for 17 years and teaching for 14 years. 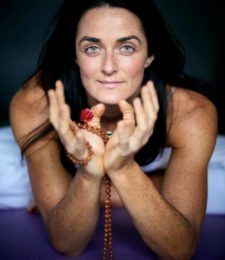 She was originally trained by the Sivananda Yoga Vedanta Center in Canada and has since gone on to train with Erich Schiffmann (Los Angeles, USA), The Krishnamacharya Mandiram (Chennai, India) specialising in therapeutic yoga, Tias Little (Santa Fe, New Mexico) and John Stirk who is both her teacher and mentor. With a classification in Hatha Yoga combined with the inner softness and grace of Scaravelli Yoga she has developed a flowing, deeply grounding and nurturing style. She believes paying special attention to the breath and alignment helps to soften and heal the body from within. Lara puts her sensitivity as a teacher down to a strong one:one approach. “I’m able to adapt yoga to the individual rather than the individual to yoga. This enables you to explore postures in greater depth. It also allows you to work on individual areas of resistance, alignment and deep emotional blockages. Moving through the practice, you will gain a greater understanding of how to allow your body to open, unfold, connect to gravity and JUST BE. There is an emphasis on right and skillful action to bring inner peace, balance and harmony”. Lara aims to provide a safe nurturing environment to allow her students to develop their own understanding of yoga in an enjoyable way. She believes one of yoga’s greatest gifts is in helping to heal on the inside by helping our minds to become more peaceful and opening our hearts to compassion and a positive attitude. As in all physical yoga, the student will increase strength and flexibility and by uniting body and breath will learn to move from moment to moment with absolute awareness. Lara’s philosophy and teachings are inspired by the spirit and practice of moving into stillness, to experience your true being. Her work and practice have been greatly enthused by her teacher John Stirk.